Welcome back! I got my hands on some CAS-ual Friday's stamps and dies finally. These ones have been on my wish list for a bit! I first started with stamping the image and sentiment. 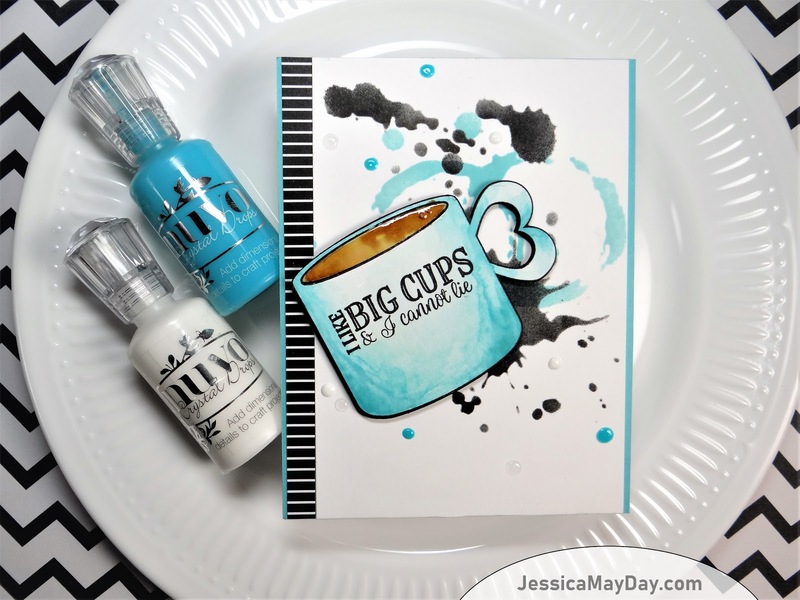 Then used several Gina K. Designs ink cubes to do an easy watercolor in aqua shades. After the coloring was done and dried I used the coordinating dies to cut out the coffee mug. I also cut another coffee mug from black foam to add dimension. Tombow glue is excellent for adhering paper and foam together and much easier then a glue runner. I used a Tim Holtz stencil to add splatters and coffee rings to a white card panel. 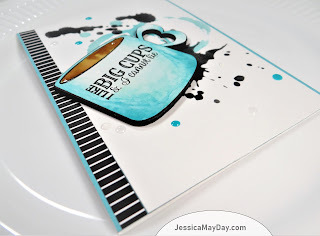 The same colors I used on the aqua coffee mug were used for the stenciling but I also blended Black Soot Distress Ink to the card panel using the more splattery parts of the stencil. After that I cut down a piece of aqua blue cardstock to 4.25x5.5 inches and then trimmed the stenciled background to 3.75x5.5 inches. 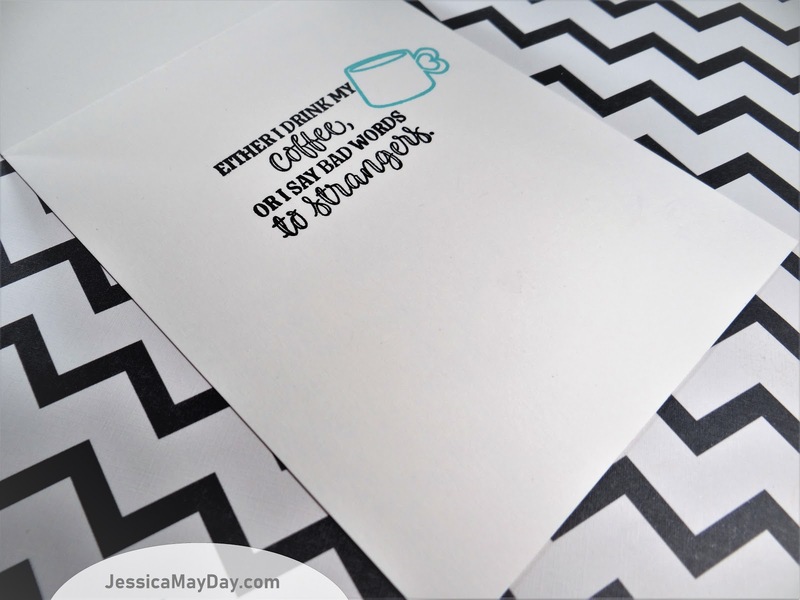 I off centered the stenciled background on to the aqua cardstock and adhered those together. A small piece of black and white stripe pattern paper was added to the left side. At this point I could adhere the card panel piece to a card base and add the coffee die cut. The only thing left to do was add some Nuvo Crystal drops among the stencil splatter and glossy accents to the oval cut out on the coffee mug die cut. This card has been entered into the following challenges. oh, wow! love this. 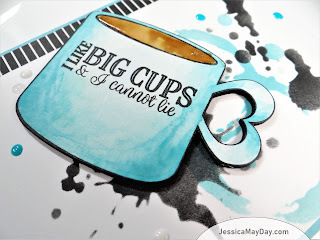 beautiful watercoloring on the coffee mug. thanks for linking up to CTD. Fabulous, artsy design! Absolutely LOVE this card! Thanks for joining us in the throwdown challenge! 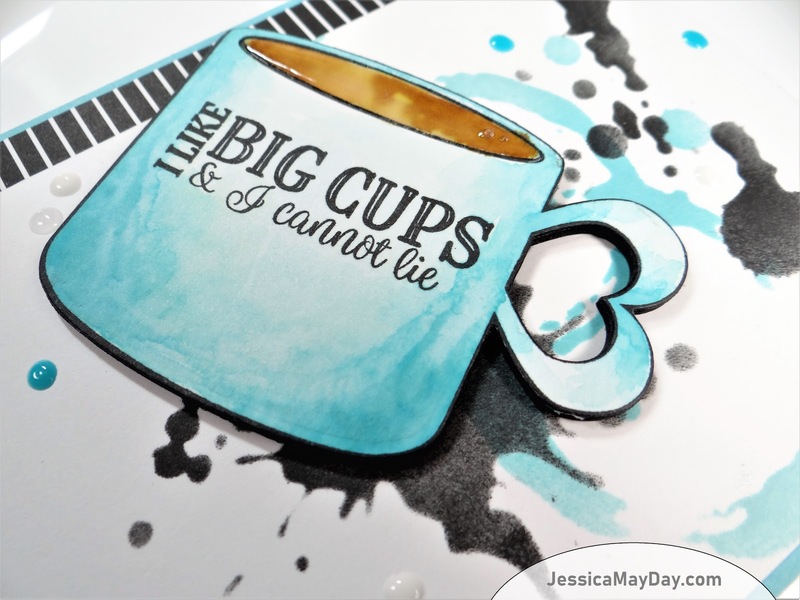 Love this graphic card with the big ole' coffee cup! So happy you joined us at CTD!